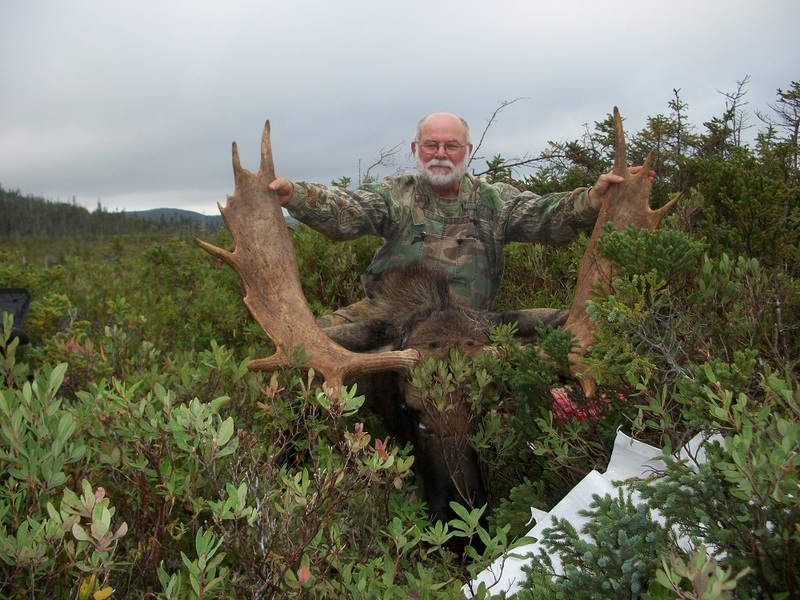 Sou’wester Outfitting offers week long guided moose hunting from three camps located at Caribou Lake, Indian Pond and Little Lake. All hunts take place in either the Little Grand Lake Wilderness Reserve or the Little Grand Lake Ecological Reserve where there are no other hunters in the field other than those at camp. Why is this possible you might ask? Both the Ecological Reserve and Wilderness Reserve are off limits to any development and structures but our lodges were there before the reserves were designated and as a result were permitted to remain. The reserves are virtual paradises situated in the middle of Newfoundland’s wilderness and along with spectacular scenery and terrain, the area has the highest Moose, Woodland Caribou and Black Bear densities on the island. 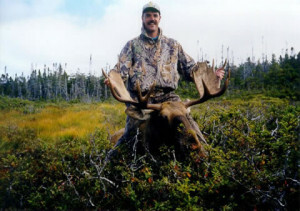 Hunting trips are available for both Non-residents and residents of Newfoundland. 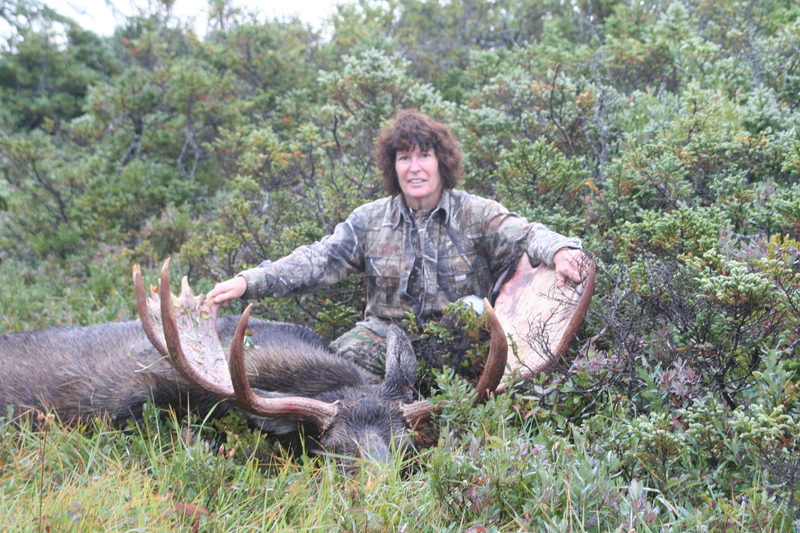 All Sou’wester moose hunts are one-on-one guided and fly-in-only. The hunt is conducted using the spot and stalk method and during the rut, experienced guides can call moose within range. Small boats are utilized to cross the larger bodies of water and allow hunters to cover the area in close proximity to the main lodges. Comfortable lodges provide the hunter with the conveniences of a modern lodge and the splendor of remote Newfoundland. Unless otherwise requested the typical moose hunt is one week in length and runs from Sunday to Sunday. Hunters are picked up Sunday morning and taken to the base site at Deer Lake Airport and flown by helicopter to the remote hunting camps. A typical hunting day begins with a wake-up call long before daylight. After a hearty breakfast the resident cook prepares a lunch for the field and at dawn the hunter and guide are off. The terrain at all three sites has open and wooded areas with lakes, valleys, knolls and mountains. It is the ultimate setting to call or stalk moose. Once in the field the guide selects a vantage point where it is possible to glass a large area. When the trophy is sighted the choice is made whether to stalk or call the animal within range. Committed guides go beyond the call of duty to ensure success. Most hunters are fortunate to take or have the opportunity to harvest their moose early in the week. Sou’wester Outfitting’s guides are enthusiastic and committed for the entire hunt and are on site for the seven days. Moose, also known as Alces alces is the biggest member of the deer family. They were introduced to the province of Newfoundland at the turn of the last century and because of the excellent forage they have increased their numbers to between 120,000 and 150,000 animals. A large bull moose can be an imposing and challenging quarry when they stand higher than a large saddle horse with massive antlers. A mature bull sometimes weighs upwards of 1,500 lbs. The mating period for moose, which is referred to as “the rut”, usually runs from mid-September to early November. Newfoundland moose are classified as “Eastern Canadian” by “Boone and Crockett”, “Pope and Young”, and “Safari Club International”. Bow, muzzleloader and rifle hunters are welcome. Sou’wester Outfitting’s annual success rate for non-resident rifle hunters is running near or over 90%. It is not uncommon for a 100% success rate with the majority being trophy animals.